Akki rotti aka a flat bread made out of rice flour is a popular karnataka dish. This is my favourite breakfast dish. Next to masala dosa ofcourse. I am yet to come across a kannadiga who does not like this dish. This versatile flat bread can be made in a number of ways. You can make it according to the recipe given below or you can go ahead and add veggies like grated carrots, or greens like methi and dill . No matter how you make it I assure you it will come out as tasty. In a bowl, mix the rice flour, onion, jeera, green chillies, coriander leaves, coconut and salt. Add water gradually and make a smooth but firm dough. Take a portion of the dough and place it in the centre of the skillet or wok. 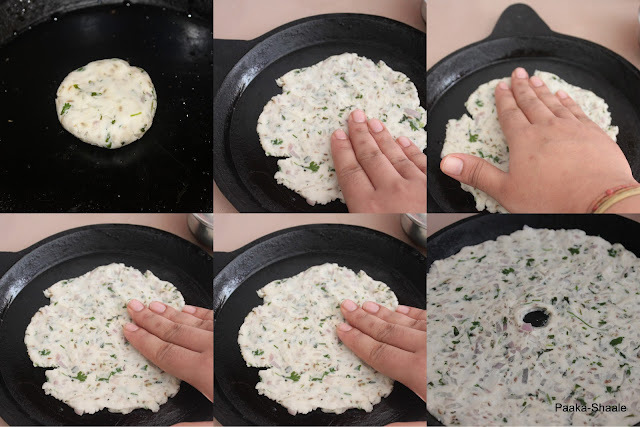 Wet your hands in alittle water and pat it evenly with your fingers to make a round roti. Make 3-4 holes on the roti and pour a tspn of oil around the circumference of the roti and transfer the skillet to the stove. Cook the roti on a medium flame 2-3 mins or till done. Take off the heat and serve hot with butter, ghee or chutney of your choice. It has been ages i had this akki roti, looks absolutely marvellous..
Ha ha..seriously no kannadiga would say that they do not like this...love it..looks yumm..I make atleast once a week...and ofcourse wid different veggies.. Tasted it at a friends place ad like the taste, shall make it soon. This used to be my favorite after-school snack! Thanks for reviving those memories! Wow,nice post,never tried so far! Nice roties! Just loved your roti, bookmarked! Love all your pictures. Pic of the cooked roti makes it irresistible! Nice and different kind of roti.Looks very tempting. May i ask you you did you make holes in these rotis? Is there any particular reason. One of my favourites! We add dill leaves to flavour this esp. when offering to someone pregnant. Looks beautiful!